Day 2: Bangkok is not pedestrian friendly. The pavements are narrow and more often than not, littered with people, be they trying to sell you something (quite often themselves), begging or just generally walking into you. Walking from place to place is not the way forward. The sky train, however, is. Fast, efficient and clean, it is everything the street level is not. Handily taking you to most of the places you need to go in the city, it is definitely my preferred method of transport. 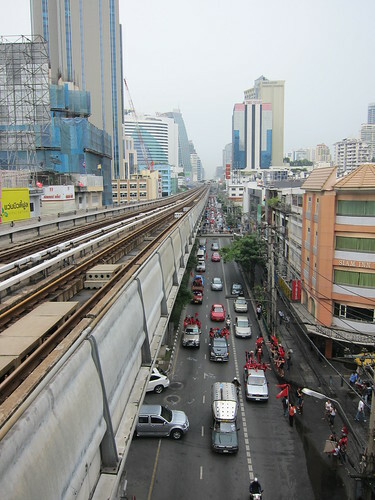 It also has excellent views as you hurtle through the city, taking you from shopping mall to shopping mall. 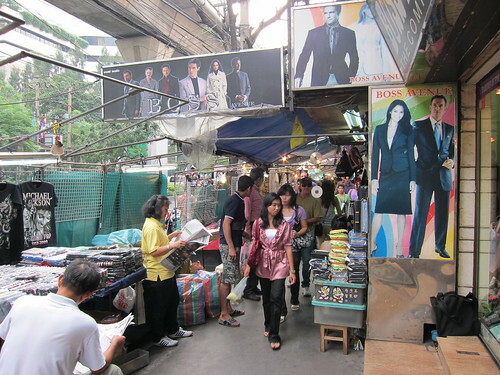 Bangkok has a lot of shopping malls and is the ideal place to buy pretty much anything you need. If it wasn't for the fact that this was my first stop on my trip, I would have filled my boots! 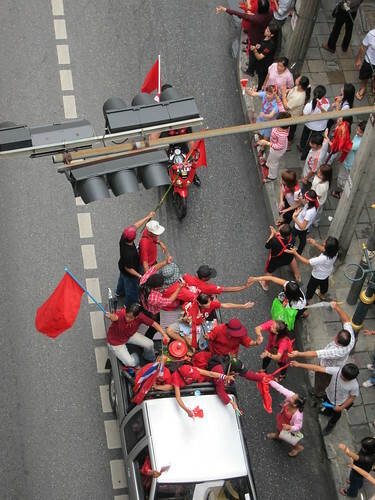 Whilst I was in Bangkok, I witnessed some of the "red shirts" peaceful protest against the current government. I don't really know much about the politics, but was touched to witness the solidarity of the people. They are standing up for what they believe in and I watched touching moments where the people were united. 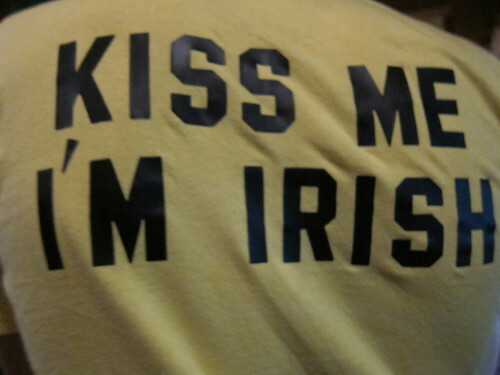 And none more so united than when I hit the Khao Sarn road for a bit of an Irish jig with my Irish mate on Paddy's day. Let's just say that some things are best forgotten. And after three Sang Som buckets, that's exactly what happened, everything past 12 was well and truly forgotten. Day 3: After the previous nights antics, day 3 was pretty much a white wash. I got up for breakfast and then proceeded to clamber back up to my room and hide under the covers, wishing all the bad people would go away. After a few more hours, and feeling no more human, I needed to make the most of the short time I had here and mustered the energy to drag my sorry self to the river. 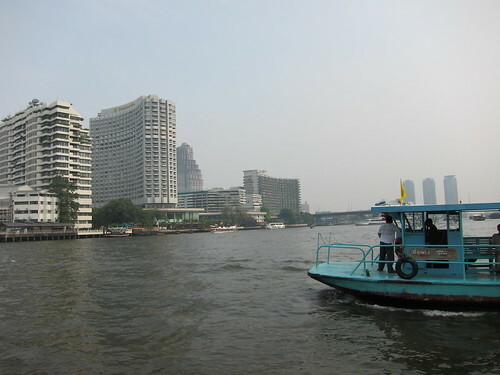 I'm not sure what possessed me into thinking that the river may have been a good idea, but I hopped onto a few of the hotel boats which shuttle up and down the river and surveyed Bangkok from there. In my precarious state, it didn't help that the Chao Phraya river is one of the dirtiest I have ever laid my eyes upon, but made it to dry land and even managed to enjoy a drink on the terrace of the Mandarin Oriental (non-alcoholic). I must admit, this short trip certainly wasn't a foodie trip. Breakfast is included in the price of my room and I was full of bacon and omelets every day, meaning that the scope for culinary endeavours was severely limited. 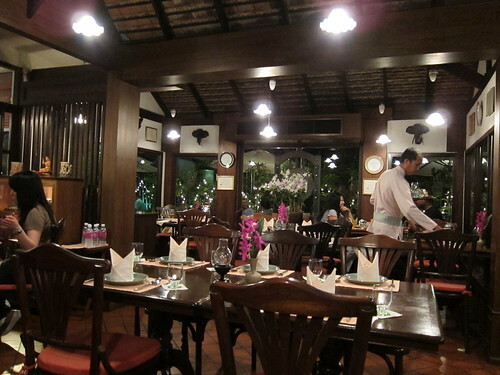 I did manage to make it to Baan Kanitha, a "high end" traditional Thai restaurant promising "flavor delicacy, service supremacy and charming ambiance" (I kid you not, check out their website). Well, it certainly delivered on 2 out of the 3. The service was impeccable. In fact, it almost felt that I had my own waiter. His efficiency was startling and he topped up my water and rice with the stealth of a ninja. The restaurant was busy, filled with a good mix of ex pats and Asians, although how many of those were actually Thai was anybodies guess. Cosy and comfortable, it certainly fulfilled the "charming ambiance" criteria. The food, however, was rather average. 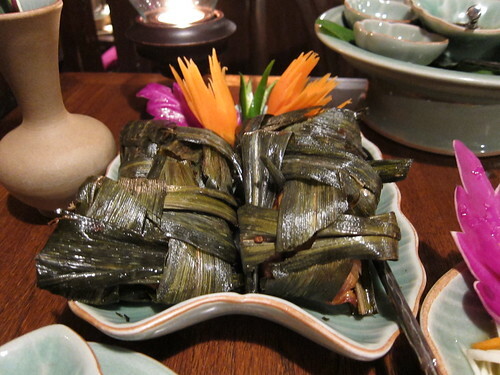 The pandan leaf wrapped chicken was bland and was dry, which defies the object of wrapping the chicken in the leaves. The green papaya salad (som tam song see) was pleasant but nothing special. 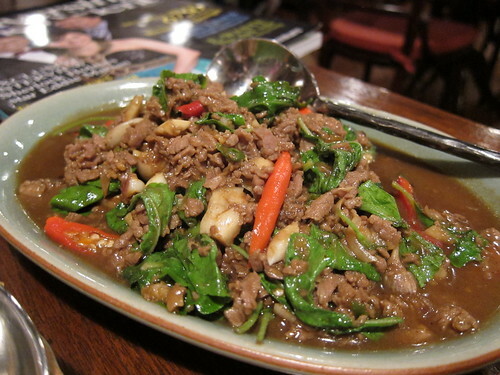 I also ordered beef with chilli and holy basil and was surprised to find it arrive in minced form. Not really what I was expecting and didn't taste all that great either. My meal came to about £15, quite pricy by Thai standards. I have to be honest, although I was pretty disappointed with my food, it may have had a lot to do with poor menu choice. I looked around and everyone else seemed to be loving their food. I guess I will never find out for sure. After dinner, I decided to head to my definite "must" for anyone travelling to Bangkok. 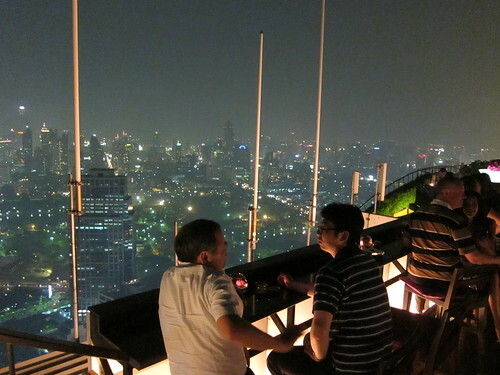 The Vertigo bar on the top of the Banyan Tree hotel is quite a sight to be marvelled. It is effectively on the 61st floor of the hotel, towering over nearly all of the surrounding buildings. 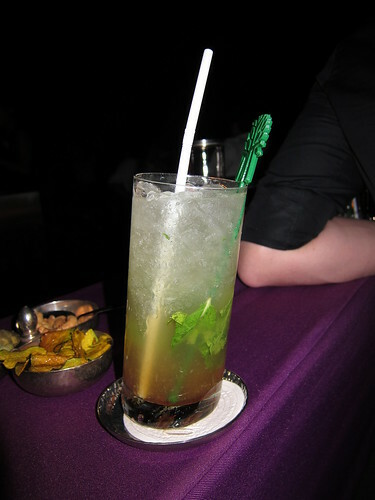 With a restaurant and a bar, you can enjoy a rather expensive meal, or enjoy a decent cocktail with nibbles. I clearly opted for the cocktail version and a few hours up here helped me clear my head and reflect on a decent few days in Bangok. So that's it. 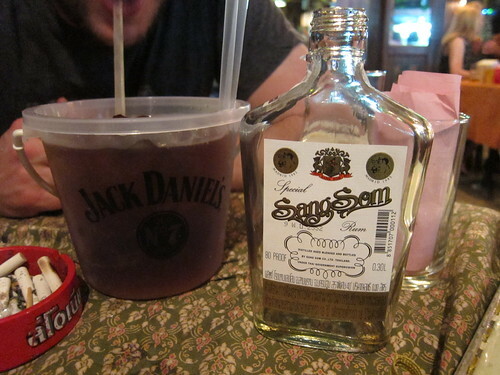 Bangkok in a nutshell. Thanks to @applelisafood and @gingergourmand with providing me with plenty of ideas for stuff to do. Ahh Bangkok. Well, hopefully you'll get more eating done in Australia :) Pity the Thai food wasn't great, I remember loving the food in Phuket (when it wasn't burning me from the insides out). 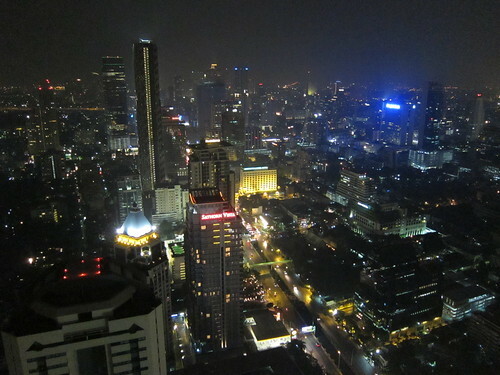 Also, love the night view shot from Vertigo Bar! Look at you, you little traveller! :) Glad to hear the protests were peaceful and doesn't look like they've bothered you too much. One of my mates is just travelling the world now and she's in Bangkok at the moment. She worried so much about the protests but seems like they aren't affecting her touring too much either. Phew! I continue to enjoy the blogs of your travels!! I'm going to pester you again to try the beef noodle soup at Cafe on the Hill, Brixton. Thought the Sky train picture was great. Happy travels! @catty - halfway through and I can genuinely say that eating in OZ is very good indeed. @GC - I really can't agree with you more. In KL, that's pretty much all you eat, although not knowing Bangkok as well, it's harder to nail down a good place as there are tonnes! Banana pancakes? Didn't see any cos I would have tried them for sure. Sounds lovely. @diva - A red shirt taxi driver drove me back to the airport and I got a pretty in depth explanation of what the whole thing was about. They are peaceful villagers just trying to make a point and the only nuisance they cause is the congestion that their protests cause. @sunfug - It's on my list of things to do! 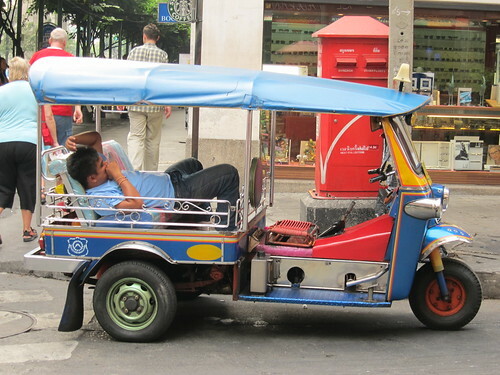 I enjoyed your post very much; I have a cousin who travels to Thailand several months a year and desperately wanted to know what the country was about! I am beginning ti get an idea now. Yay! I'm so glad you went to Vertigo Bar! The views are to die for aren't they? There's a moment as you come up the stairs, expecting a standard roof top terrace all boarded in but out you pop on top of the world with the whole of Bangkok laid out before you!